I worked over the weekend, if you can call it work. 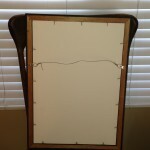 It was a lot more like learning to do something I’ve always wanted to do for myself…framing! 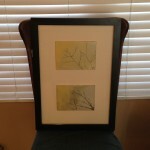 So I took a class at The Columbus Idea Foundry called Framing and Matting. I chose two 5×7 ink pieces that I had done with brushes and with a calligraphy pen. I didn’t think that something this interesting was going to be an option, but I’m glad that it was. It was 6+ hours for me but it was great. Check out my handiwork. 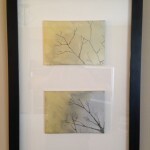 Art work and the floating matting. The backing with the points and wire. While there’s room for improvement I’m proud of this work. The framing itself I found a bit difficult, but I was better by the time I was putting the last corner together than I was doing the first. The glass cutting while simple was really neat and the matting tricks to get the pictures to float while keeping them from touching the glass was perhaps the most interesting part of all. My time away from traditional work has been an exciting and wonderful time. Thanks to those who read this for sharing in my adventure with me, please feel free to leave a comment and if you’d like to check out some of my other artwork please check out my Etsy page. Remembering that I truly want to be happy is the first and often hardest step of living the life I want. I’m doing a great job of that these days and it is starting to show.